OutPost can be used to produce customized proof sheets using the "Add Sheets" functionality. This article guides the reader through producing the simple proof sheet reproduced below. Note "proof sheets" are often referred to as "item sheets" as they require a Fixed Size "Item" template. The proof sheet above is a result of a single template. 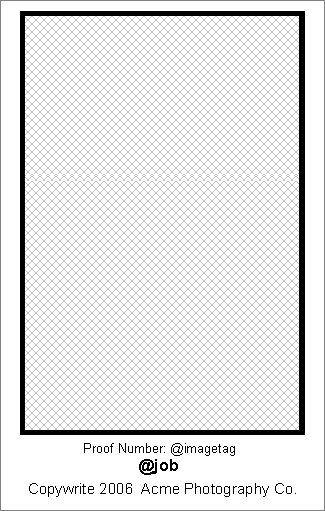 This template is a Fixed Size Item and describes the appearance of each "cell" or "item" on the proof sheet. The template may contain any combination of image holes, fixed and variable text, barcodes and graphics. A close up of an individual item from the above proof sheet is reproduced below. Note the presence of both fixed and variable elements. The image itself, the proof number and the customer's name are examples of variable elements that may or may not change from image to image, job to job. The copywrite notice and the company name are fixed text elements. As mentioned above the appearance of each image on the proof sheet is controlled by a template. Template design is therefore crucial. 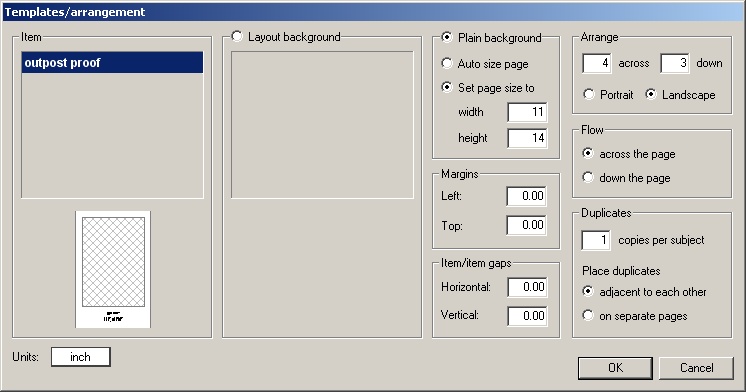 Wherever possible templates should be designed as generic as possible enabling the template to be used from job to job. Start a new template by either clicking the New template button on the toolbar or via File>New from the menu. Ctrl-N is a keyboard shortcut to start a new template. You will be presented with the New Template Design window. 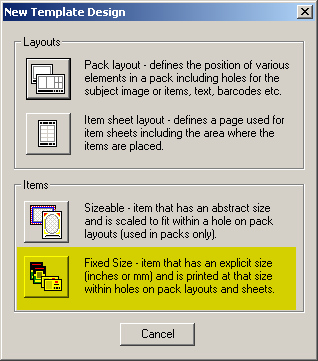 You must select the last template type - Fixed Size Item - as only these templates can be used for proof sheets. Observe the screen grab below with the proper selection highlighted. Add image holes, text boxes and any other objects to the template as desired by using the appropriate tools from the toolbar. Size and position each element as appropriate. Once the template has been designed and saved return to the Main Mode (F4). The steps below assume images have already been imported into OutPost and data (if any) has been assigned. Select the images you wish to appear on the proof sheet. Click the "Add Sheets" button located in the upper right window pane.